It's been far too long since a Dragon Ball Z game has come west from Japan. We missed out on both Dragon Ball Kai: Ultimate Butoden, a 3D fighter, and Dragon Ball Heroes: Ultimate Mission, a card-based battler, here in the states - and I'm still sore over it. As Dragon Ball fan #1, I was breathlessly excited when the PS3/Vita game Battle of Z was confirmed to release outside Japan, and the wait is finally over for the newest in a long line of Dragon Ball fighters. How does this one hold up? Going in, you need to know that Battle of Z is unlike any Dragon Ball game before it. In fact, it is unlike any game I've ever played. The basic premise is players choose up to four different Z fighters and head into battle. Once in the thick of things, three computer-controlled characters take on different roles, such as tank, healer, etc., while you control a single character in the fight. 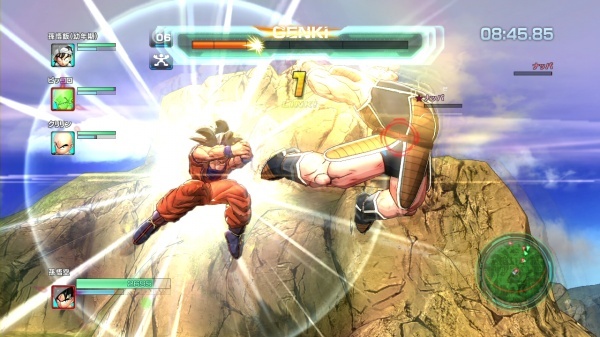 You have complete range of movement in the 3D battlescapes, and fights mirror the plot of the show, from Raditz's arrival on Earth to Majin Buu and beyond. The end result feels a little like a Soul Sacrifice, with multiple opponents squaring off in an arena against one or more enemy fighters. It also feels like the straight up fighting games before it, with combos, super moves and the like. Finally, a card system and experience let you level up your chosen team of fighters, give them new abilities and play Dragon Ball: The RPG. Kinda. As tough as it is to explain, it is even tougher to learn. Battle of Z gives you zero help in the way of tutorials, leaving you to figure out the hybrid game design on your own. It took about 3 hours of solid fighting before I realized what the game wanted me to do, and it was even longer before I figured out the cards, leveling and shops. I wonder if casual Dragon Ball or fighting fans will stick it out long enough to learn the ins and outs of battle, or whether I was determined enough based on my love of the property. Luckily, those who do take the time to learn will find a deep fighter/brawler that can be all at once rewarding and maddening. The story, as I said, follows the entire Dragon Ball Z run from beginning to end. If you've already heard the main story, you won't find anything new here. The plot is, like with 99% of anime games, indecipherable without some existing knowledge. Fighting games aren't really known for knockout stories, so I guess you can give Battle of Z a pass for simply reinforcing genre conventions. We all know the story isn't impossible to tell in game form (Budokai on PS2 did a nice job), but not much effort was made with this one. Moving on, the graphics and sound have their positives and negatives. The biggest misstep is the lack of Japanese audio in the Vita version of the game. As a big fan of the original, I have a lot of trouble stomaching the voice acting of the American Dragon Ball dub. These actors aren't bad; they just aren't right. If you can't see why this is an issue, imagine Homer Simpson with Peter Griffin's voice. That's what it sounds like when fans of the original series have no choice but to listen to the American dub actors. Thankfully, depending on which systems you have in your home, the PS3 version of the game does have a dual audio track, allowing purists to experience the game the way they want. The intro movie, however, is only presented in its glorious original language across both versions, but I'll save that for my "Dragon Ball nerd" paragraph a little later. The graphics in Battle of Z are just a step up from what we saw in Ultimate Tenkaichi and Raging Blast 2. These character models look closer to those found in the Japanese arcade card game, with a more physical weight and less cel shading. Battle of Z is still two steps behind the arcade game in the visual department, but it's definitely one of the prettiest Dragon Ball console releases. Before I nerd out on you, let's take one last look at the gameplay. What I briefly described before remains true; this game has more in common with hunting games or MOBAs (multiplayer online battle arenas - League of Legends, if you still don't know what I'm talking about) than any fighting game. Each character on a team has a definite role to fill, and deviating from it with result in certain death, much like if an MMO team's healer starts using physical attacks. Characters like Kid Gohan and Krillin are healers by nature, whereas Goku is a melee fighter and Perfect Cell is a Ki Blast specialist. Getting the roles to work as a team is absolutely key to getting through any of the game's tougher fights. Once this is understood, you can begin to work with the equip system, the cards. Battle of Z is really all about these cards, from collecting them all to earning the points to buy new and better ones. Once you understand the team dynamic, making yourself view the cards as you would gear and weapons in a traditional RPG will go a long way in allowing you to enjoy the game to its fullest. If you've got melee fighters, you'll want cards that up their melee damage and melee defense. Similarly, healers will need ki enhancers and upgraded movement abilities to succeed. For me, collecting the cards and balancing my chosen fighters was every bit as engaging as the fighting itself. Disappointingly, the game expects you to just know or learn all this with no guidance, severely limiting a truly fresh take on the Dragon Ball video game world. Once you do get things figured out, you'll notice the game's main problem: the A.I., specifically your teammates'. Most stages require teams of three or four, filling out the roles I talked about a bit ago. These computer-controlled fighters can often be as deadly as the enemy it/themselves. If you get knocked out as a melee fighter and need to be healed, your healer will do his job about half the time. 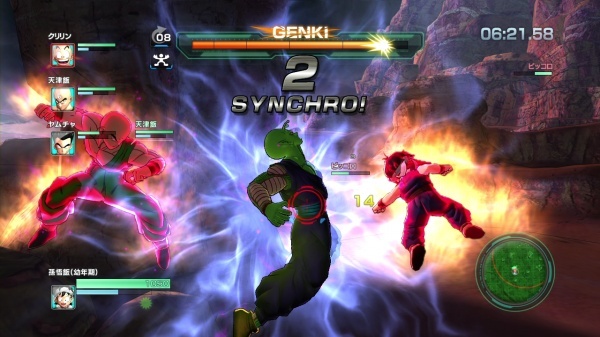 The "tank" characters often abandon strategy altogether and fire beam after ki-wasting beam at enemies. Synchronized attacks are all but impossible to pull off on purpose, from the multi character melee beatdown to the trademark "teleport, smash, send flying to another warrior for same process" chains. As a gamer who truly loathes multiplayer in all its forms, it pains me to say that Battle of Z is a game best played online with friends, rather than as a lone wolf. I noted above that the PS3 version of the game does have the Japanese audio brilliantly intact, while the Vita version does not. Unfortunately, this isn't the only area where the versions differ. The PS3 version also supports DLC, a perk left out of the Vita version (for now, anyway). On the PS3, a pre-order would net players a new character depending on which retailers they bought from. A "sage Goku" skin was available, as were Super Saiyan Bardock and Super Saiyan Vegito. Because Battle of Z doesn't have in-fight transformations, if you want to see these forms, you would have needed to pre-order. Maybe they will be available for paid download one day, but not now and not at all for the Vita version. Except for cosmetic differences, everything else appears to be the same across both versions of the game. Battle of Z's style, to me anyway, seems more suited for a portable than a console, so my pick would be the Vita version, had I needed to choose. Sure, I miss out on better graphics, the Japanese audio and DLC, but having the game with me for quick battles on my lunch hour or when no one is looking at work swings me toward the portable version. The two games are similar enough that you need not feel like you are missing out by choosing on over the other, though. As promised, I'll wrap things up with my nerd observations. First off, the new intro movie is absolutely brilliant. It features some brand new hand drawn animation and a cover of the famous HEAD CHA-LA Dragon Ball Z theme. As great as this intro looks, the song steals the show. It reimagines the goofy little theme song into a rousing, techno punk anthem, and makes even seasoned (i.e. obsessed) fans hear another side of a tune we've heard literally millions of times. Also of note is the video game debut of Bills (as he's known in English), the God of Destruction, his partner Whis and Goku's Super Saiyan God form. If these don't ring a bell, don't worry about it; I'll catch you up. Bills is the new villain from a brand new Dragon Ball movie released in Japan last year, called Battle of the Gods. Whis is his sidekick/butler/friend. And without going into it too much, Goku's new Super Saiyan God form is a form beyond that of Super Saiyan 3, and requires some very special - and borderline ridiculous - circumstances to achieve. You'll see Bills and Whis in the new intro, but you'll have to wait for FUNimation to get their act together to watch the film (legally) here in the U.S.
Assigning a score to Battle of Z is tough. It has gameplay unlike anything I've played before, and Dragon Ball fans will find tons to love. At the same time, the lack of tutorial, concessions made to the Vita version and the steep learning curve make it tough to recommend to everyone. The A.I. is perhaps the worst issue of all, making this a more shudder multiplayer-focused game than a single player one. This is not one of those "for fans only" anime games, because those with the time and patience, fans or not, will find a bizarre and ultimately satisfying game under all the layers of missteps. It has been two years since we got a Dragon Ball game in the U.S., and for some, it will have been worth the wait. Final Rating: 74%. At its core it's a bizarre but ultimately satisfying game.